A galaxy is a collection of dust, trillions of stars and gas that are held together by gravity. There are billions of galaxies in the universe and one of the largest ones that we currently know of is the Milky Way. However, some galaxies are even bigger than the Milky Way itself. There are three main types of galaxies. The first of these three types of galaxies is the elliptical galaxy which are fat in the middle and then, taper off towards the end of the galaxy itself. The largest galaxies that are known of are elliptical galaxies which are made of more than a trillion stars held together. These galaxies are usually much bigger than the Milky Way. The second of the various types of galaxies are spiral galaxies. The Milky Way is an example of a spiral galaxy. One will find numerous bright spots in the middle of the galaxy and many spirals can be seen wrapping around the center of the galaxy. The spiral waves are similar to waves that can be found in water and these waves are known as density waves. Interstellar gases are squeezed by these waves and that is also how new stars come to be/exist. The smallest of the various types of galaxies are irregular galaxies and astronomers believe that it is from these galaxies that other galaxies come to be formed because of it. 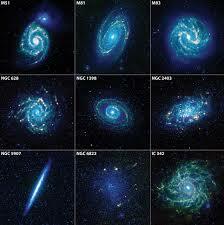 It is the origin of the other galaxies as per astronomers. Then, there are dwarf galaxies which are believed to be the smallest of all galaxies and consist of a few billion stars. These kinds of galaxies can be found orbiting other types of galaxies as well- such as the Milky Way, spiral galaxies and such like. These may be part of a galaxy. It is not necessary that they would always be found on their own, after all. The Milky Way is formed of a large number of dwarf galaxies that are clustered together and these together form the Milky Way.